Aqua workouts are not new but this one is. 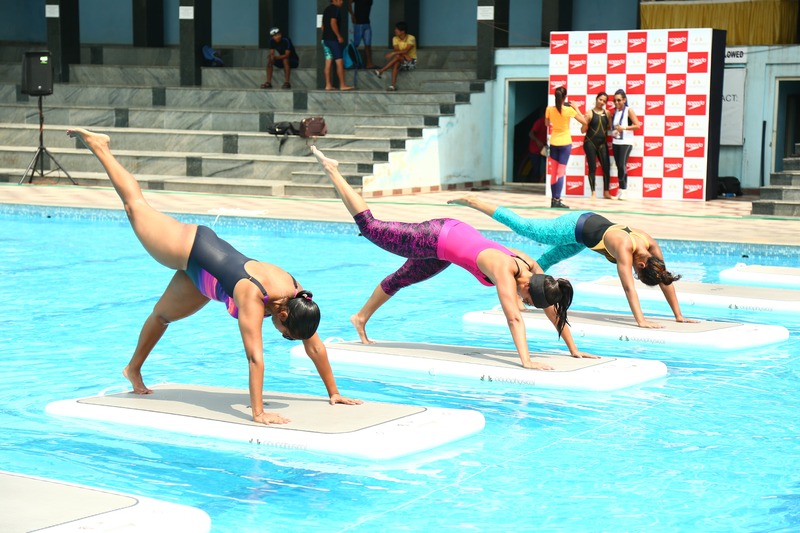 Speedo India in association with Aquaphysical is now giving fitness enthusiasts, FloatFit, a new way to stay fit. “You are invited to join the water based fitness revolution FloatFit” said an invite in my mail box. What intrigued me was the picture that accompanied the mail where I saw two people exercising on a mat floating on the water. So I made my way to the venue and was surprised that was indeed a workout done on a board – that floats in water! In fact this felt like a yoga mat but this was on water and the exercises done largely mimic yogic postures too. The first section of the FloatFit Class is all about finding your feet, building confidence and most importantly, warming up. Starting sat down in the centre of the AquaBase, set movements are designed to bring participants onto their knees and standing up. Exercises are completed at every level, e.g. Leg Raises (lying on the AquaBase on your back), Superman Abs with Tuck (on hands and knees) and Rockers (standing up). Eyes can be closed for an additional challenge. Circuit exercises including Squats, Side Squats and Hip Thrusts. Circuit exercises including Press Ups, Planks and Shoulder Press. Circuit exercises including Superman, Back Extension and Swimmers. Circuit exercises including Flutter Kicks, Star Abs and Mountain Climbers. FloatFit Class participants are split into Team 1 and Team 2 in the following order: 1, 2, 1, 2, 1, 2. Team 1 holds a Plank, V-Sit or Squat whilst Team 2 attempts to make them fall off the AquaBase with rocking their AquaBase from side to side as hard as possible. The Teams switch after 30 seconds. This is usually when most people fall in! Incorporating yoga style movements into a Cool Down and Stretch, you will see Upward Dogs, Side Bends and Chest Stretches. Ask the FloatFit Instructor to take photos and videos on your phone after the class. FloatFit Classes are fun, effective and challenging. They are designed to give different levels of difficulty to suit your personal level of fitness. “You can set yourself a challenge or take a less intense workout it is up to you. I have been in classes with all types of people from men in their 20’s to women in their 80’s. If you return to FloatFit Classes week after week you will amazed at your progress,” avers Francis. 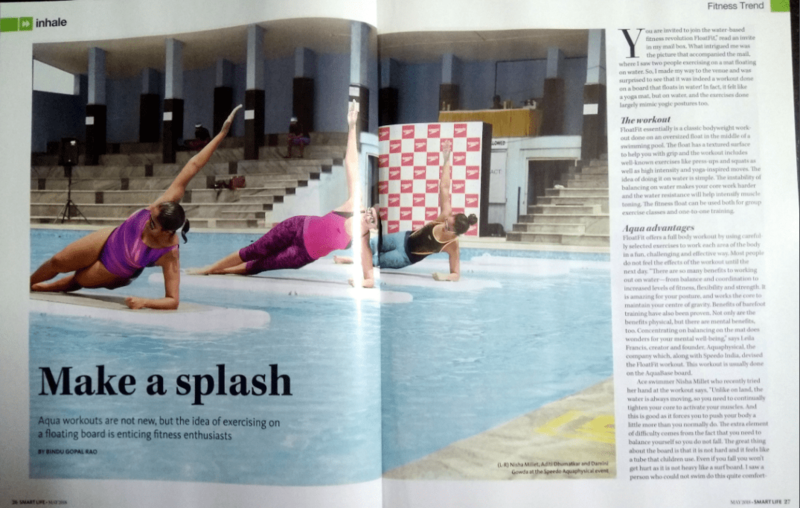 Murali De Singh, Business Head at Speedo India says, “water workouts no longer just mean lane swimming; with the help of training aids and HIIT exercises, fitness enthusiasts can achieve more in the water than ever before. The Floatfit® classes by AquaPhysical are a low impact, exciting and fun way of exercising in water. It provides a complete body workout incorporating strength, stretch core, balance, alignment, bodyweight and barefoot training all at once.” It is recommended that you wear gym clothes that can be immersed in water without damage. Water can make clothes stick to you, so it is important that you feel comfortable and can move easily in what you are wearing. For most, working out in style is also an important factor in feeling good and staying motivated. Do not forget to bring a change of clothes with you to change into after the class. Athlete Dhanani Gowda who experienced the class explains, “it is basically all the core exercises that you do in the gym that is done on the water on the boat and helps improves fitness. We did a 30 minute workout that started with warm up routine to stabilize the core and we also did squats and burpees.” I think if you are not used to exercising, it will be a challenge so it is better to get a briefing on land. In spite of the fact that I have a stable body, I found it hard to balance initially. The idea is to not fall into the water so pre training will help. However this is a good fun workout and something different as well even though I had some aching muscles at the end of it.” So if you are looking to challenge yourself to be fitter, hop on to an AquaBase – a cool way to beat the hot summer too. Stay in the centre of the AquaBase and maintain a low centre of gravity to stay balanced. Build confidence by challenging yourself. Do not take part if you are not water confident.